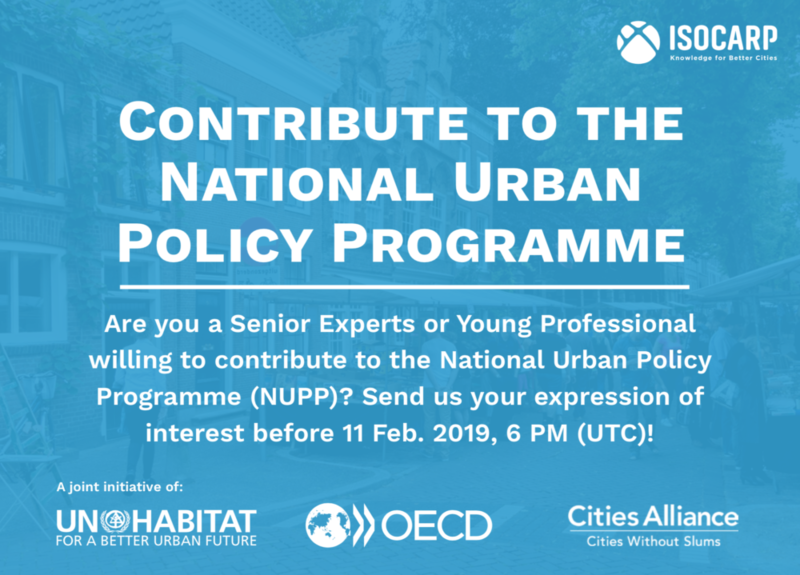 ISOCARP will support the National Urban Policy Programme (NUPP), a global joint initiative of UN-Habitat, OECD and Cities Alliance. First, as part of ISOCARP’s contribution to the NUPP, we are looking for Senior Experts among our members, who want to support the NUPP. Possible work areas include: 1) contribution to policy analysis in selected countries to be carried out within the NUPP framework (e.g., drafting an analytical paper on specific areas of urban policy) and 2) contribution to the second edition of Global State of National Urban Policy (e.g., monitoring and evaluating NUPs). The contribution will be pro-bono but acknowledged in the outputs. Furthermore, there may be an opportunity to contribute as an external consultant. The volume of work, working time, and location are negotiable. Second, also as part of ISOCARP’s contribution to the NUPP, we are looking for Master, (post) PhD students and young professionals, who would like to assist in the abovementioned work, and/or to support the Secretariat function of the NUPP. There is an opportunity to contribute externally on a voluntary basis, or internally as a student intern. If you are interested, please send us your most recent CV and a brief introduction/motivation to jobs@isocarp.org with “NUPP Senior Expert OR Young Professional + Your Name” in the subject line. Application Deadline is the 11 February 2019, 6 PM (UTC).